Kidney failure and kidney meridian dysfunction result from an imbalance of yin and yang. Herbsmith Rehmannia Assist Kidney has cooling herbs that nourish the kidney and tonify kidney yin, or fluids, allowing the kidney to function to its fullest capacity. The kidney is considered the flame of life in Chinese medical theory. So it is no surprise that many older pets develop marginal kidney function or kidney failure as they age. 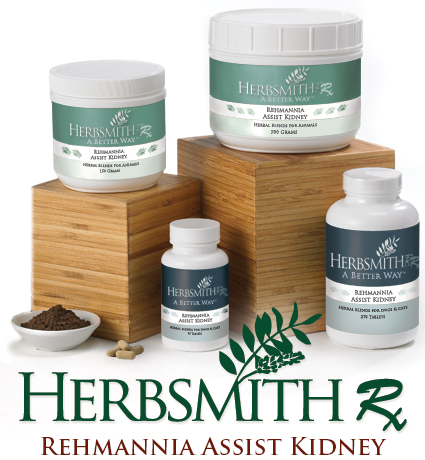 Herbsmith Rehmannia Assist Kidney is a classic Chinese medicinal herbal blend to nourish the kidney and tonify kidney yin. In all life there is a balance of yin and yang. Any imbalance of yin and yang will cause disease, such as in the kidney. The kidney often develops a depletion of yin or the fluids of life. Tonifing the kidney yin or fluids will assist the kidney to function to its fullest capacity. Hearing loss and weakness to hind limbs is also commonly seen in our older pets. Chinese medical theory explains this commonly seen occurrence. The lower back is considered the lumbar mansion of the kidneys. The kidneys nourish the bones and especially the marrow. As the kidneys become depleted with age or chronic stress, the skeletal structure in the lower back and hind limbs become weak due to lack of nourishment. The kidneys also nourish the ears so as kidney yin is diminished so also is hearing.